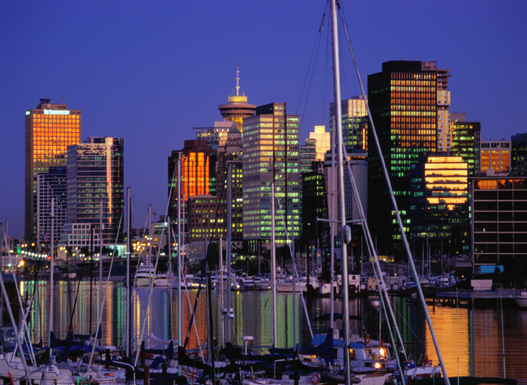 Vancouver, British Columbia, is known as Canada's emerald jewel for its lush rain forests. On a clear day, from downtown you can see the Strait of Georgia's blue-green waters, glacial fjords, islands, and mountains with snow caps and dense forests. The city is home to people from all over the world and has continued to draw many immigrants from China, other parts of Asia and around the world. Vancouver is relaxed and outdoorsy, yet cosmopolitan. It's also sports-minded, and its hockey fans cheer hard for their NHL Canucks. The city also boasts high-fashion boutiques, a vibrant arts scene and a fondness for health-conscious eating. The winter weather of gray skies and drizzle only emphasizes Vancouver's attractions at other times of the year.